The white chocolate sphere now has an easy to follow recipe. It can be drizzled with either hot rum caramel or hot chocolate, you choose. The veil is broken, and the crown jewel sponge is revealed. This time is is dark caramelized bananas, crispy pound cake, luxury French vanilla ice cream, and that sultry hot rum caramel. 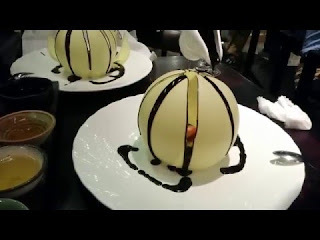 White chocolate can be extremely difficult to work with when making the sphere, even when it’s tempered. Keep in mind your ambient room temp or any heat source (including yourself) before attempting chocolate work, especially with white chocolate. Melt 2/3 cup of white chocolate chips, using the double broiler method. Mix the chocolate as it slowly melts to ensure all of the solids liquify. Do not exceed 120°F. Once the chocolate has throughly melted, remove it from the stove and mix in 1/3 cup white chocolate chips to cool the mixture. Gently stir in the chocolate chips until the mixture is smooth and approximately 88°F. Once the chocolate is tempered to 88°F, add a few table spoons of the melted white chocolate to your chocolate mold. Close the mold and gently rotate the sphere until all sections of the mold are coated. Then allow it to cool in the fridge for 30 minutes. Flip every 2-3 minutes to ensure is cools evenly. Toss in the banana pieces along with a thin slice of pound cake. Caramelize the ingredients until they are gold brown on all sides. Once the pound cake is golden and crisped, remove it from the pan. If the chocolate has had enough time to set, remove it from the fridge and gently remove it from the mold (be careful not to over handle the ball with your hands or it may melt). Carefully top the dessert with the chocolate ball. Lastly, drizzle the remaining hot rum syrup (or hot chocolate) over the chocolate ball, watch as your dessert as is revealed, and dig into this sultry treat!